Hello, Comrades! 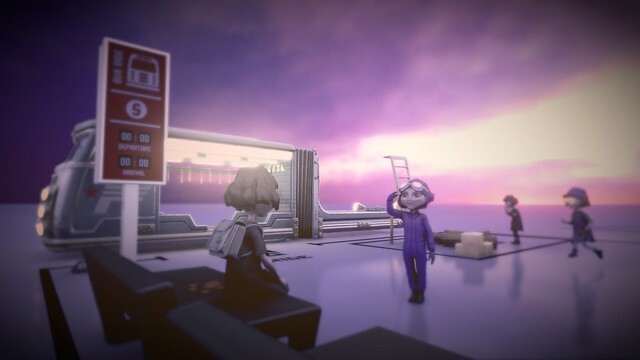 Today it gives me great pleasure to announce The Tomorrow Children will be launching next month on September 6 with the early access Founders Pack! We will also be opening the game up to everyone as a free-to-play title in the near future. 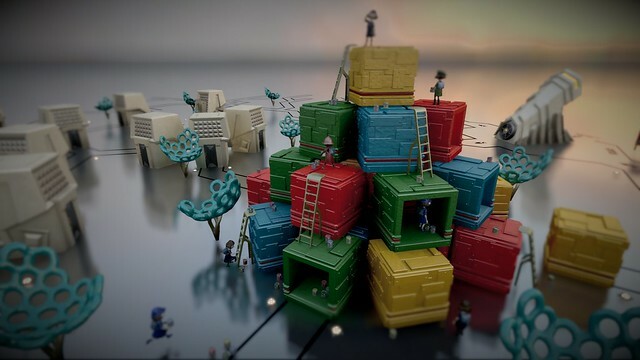 Starting on September 6, The Tomorrow Children’s early access Founders Pack will be offered for a limited time until the official launch of the free-to-play game. The Founders Pack bundles together a great selection of paid DLC items, 1000 Freeman Dollars (in-game currency), and exclusive bonus content, giving players a big running start as they dive into the world of the Void. Owners of the Founders Pack, as well as those invited by Founders to experience the F2P game early, will also be able to purchase additional Freeman Dollar packs from PlayStation Store in order to purchase additional Black Market items in-game. 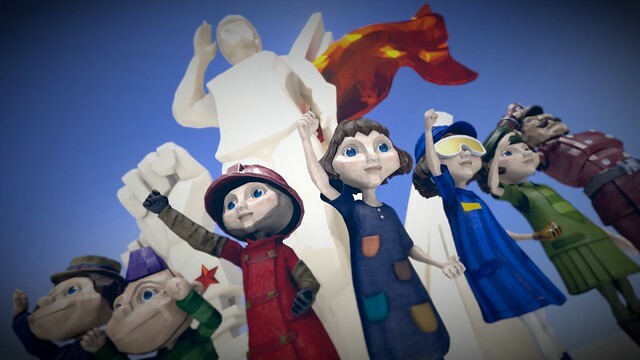 In the coming months, Q-Games and Sony Interactive Entertainment will launch the Free-2-Play version of The Tomorrow Children. The Founders Pack will also be replaced by the Frontier Pack bundle, including DLC content and Freeman Dollar Currency (details TBA). Stay tuned for more updates, and for more details on The Tomorrow Children, visit the website. See you in The Void on September 6! Onwards, Comrades! Glory for all! I can’t wait! I’ll even through some money your way. Thank you very much, it took us a while to dot the i’s and cross the t’s but we are here now, and it’s going to be awesome! Really excited. can’t wait to be able to get my Founder’s Pack. Thank you for this Amazing game! I look forward to visiting your town! Finally! Been excited for this ever since I got to play the alpha. I had given up hope on The Tomorrow Children; we haven’t heard anything for so long. Glad to hear it is coming soon! Will definitely be snagging a Founder’s Pack. The trophies for this game went live several months ago, so I’m surprised it’s still another month until launch. Though, seeing as it’s free-to-play, I understand now why the list didn’t have a platinum. Will be keeping an eye out for more gameplay once this starts getting out into the wild. It’s only a couple of weeks really not a month! Not gonna lie, I had forgotten all about this game lol. Glad I stumbled upon this page. Excited. Tell me… is there still a chance to get on the founders edition? We added a ton of stuff since then so welcome back! So happy that we finally get a release date. The Alpha was amazing. Q-Games has always produced quality, fun titles!I have to wait though to grab it since my dad n sister are now living with me because of the fire. Keep up the good work and games. See everyone on in the future!!! I hope to see you in there soon! Will definitely be buying a founders pack! Looking forward to checking this game out. Looks like we maaade it. Was this always planned as a free to play game? I’m not convinced on the “free to play” part, but I hope the game is as good as it looks. Don’t worry about the f2p aspect, if you get the founders pack you are good to go. I was a member of your Alphas and I liked it! I think it’s a great mix of genres and cooperation by other players. Cannot wait to progress in this free to play game! Thanks! We’ve tuned and added a no. of things since then too so it’s all going to be pretty exciting! I’m so excited for this!!! I’ve been waiting a long time since I first watch people playing the Alpha. I wanted to ask if you would consider making several “Dynamic Themes” and also a “ShareFactory Theme Pack” for gamers who want to make ShareFactory videos of your amazing game? Cheers and have a great year! I’ll look into this, it’s the first time I’ve heard of a request like that! Nope, not going to support communism in any form of it, game or book or movie…, paid or free. F communistic SOCIETY. So in other words you should support it. You realize you aren’t supporting communism by playing a game set in faux-Soviet Union any more than you’re supporting murder when you play a shooter, right? Although it does show how working together in harmony can achieve great things but that isn’t a message limited to communism. I’m not getting now that i know it’s anti-communism…seriously. OPEN TO EVERYONE, BUT DON’T BE A JERK. So don’t be a jerk and take a Chill pill. I’ll make some popcorn! This is getting interesting! I’ve been anticipating this game more than any other ever since it was announced. I would have gladly paid twice this, so Founder’s Pack here I come. Excellent to hear, enjoy the ride! I had a blast playing two betas. Yay! I love the art style. Looking forward to this one. It will be up on the store on sept 6th! Finally I can get lost in the void !! Has the frame-rate improved at all to 60fps? The alpha killed it with a bad frame-rate.. I would purchase the founders for a 60fps games.. not one that’s gonna wait to be 60 for Neo..
We didn’t sit on our laurels though, we took the data from the beta and adjusted quite a lot of things! About time!!! I was looking forward tto release since the closed beta. So much fun. Hope the network is improved and jet pack here i come. You’re going to love some of the tweaks since the beta! I REALLY wanted to get into the Betas but sadly I was not chosen. I love all of your games and I am truly excited to finally get a chance to play The Tomorrow Children. The game looks outstanding. Well done and congrats! Awesome, can’t wait to see you in there! Can’t wait, enjoyed the beta! Got 5 friends already in mind for the invite! Thanks! AWESOME i cant wait to play ! keep up the great work ! i was just wondering any changes since the beta? this is my game of the year !!! the beta was amazing! thanks for your time! Is the original version of the game is free?? or its paid and there is a free to play version??? The game is free-to-play. The paid DLC/Founders Pack just gives you a head start. Its the same game for everyone. Good to see I can finally delete the Beta version that has been sitting on my system for a few months and download a ‘real’ version of the game. Ohh finally!! Is this server independent from country to country? Or just one server for all? Anyways, I played beta earlier but I haven’t got my lifetime pension yet. that great to hear! will there be any server wipes after early access? will i be able to keep my progression ? thanks for your time and keep up the great work! The term early access here isn’t the same as, say, a game on steam. It really does just literally mean you get early access to the full game, there will be no server wipes or resets. The game goes fully live from sept 6th. Will there be a disc version of the game ? I think the last time I got really excited about a game was FF7. Just like then I will go out and buy a Playstation just to get the privilege of playing TTC. I’ve never seen anything as beautiful on screen. This is really a revolution in game graphics. Why VR when these lighting environments are more beautiful than the real thing? I wish I could invest in your company. So how do we get the Founders pack? I was in the alpha. I can’t wait for this game!! I feel silly but I’ve just happened upon this game (which looks really great, by the way!) and I can’t seem to find this anywhere but – does it require ps plus to play? Currently without a membership and won’t have one on the date of the release. I’d LOVE to have this game! But, like “The Witness”, I won’t be picking it up without the release of a physical copy….and Im still waiting on The Witness. Im missing out on a great game but, business is business, if I miss out on two games, I guess I miss out on two games. We’re not totally living in the digital age yet. Do the 5 invitations give access to the early access? Nevermind, it seems i didn’t read clearly. Lets say i buy the pack but i don’t have an interested party to give out the 5 keys, will my town then be only me? Hello Dylan i wait for early access because this game is cute and strange with many things to do ! But all the founder pack content will be available for free ingame by anyone playing later to f2p … I see it in beta walkthrough …What is the real advantage to be founder ? Hello I am curious as to what time this game goes on to the store. I’ve been looking forward to a release since I played the alpha! Im excited to play and already have some friends ready to play with me. Hurry up and be free. I wanna play it for free, not $20. so, the bourg’ papers. are they only for paid versions? or is there a way to get them as a free player? otherwise i would say you miss out on about 90% of the fun.